The Traffic Sources report is one of the most important reports in Google Analytics. This report gives you insights into your blog readers and the most important information you need when you’re preparing your blog to work with advertisers and brands. To view your Google Analytics reports, log in to your account and simply click the View Report link next to your blog name on your Google Analytics home page. This will bring you to your Dashboard, which gives you the highlights of the most important information in your analytics account. Your site traffic will come from four sources: search engines, other websites, direct traffic (people who have bookmarked your site or typed in your site address), and your RSS feed. A healthy site will have a good balance of traffic from all four sources. You never want to have all your eggs in one basket unless you’re the Easter Bunny, and frankly, not even then. To view the Traffic Sources report, go to your Dashboard and click Traffic Sources on the left menu. 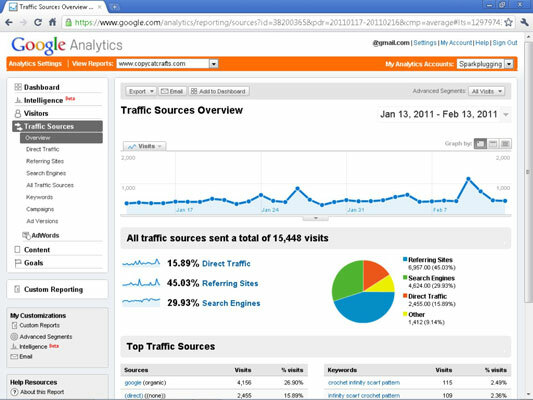 Traffic Sources Overview in Google Analytics. The following list describes your search engine traffic. You can find this specific report from the Traffic Sources report by clicking the Search Engines link. Traffic Source: Search Engines report: If you have a high percentage of search engine traffic, it means you’re acquiring new readers on a regular basis interested in certain topics determined by your keywords. Why brands care about Search Engine Traffic report: Search engines tend to be a consistent source of traffic over the long term, and provide an indicator of the trust level of your website. Why you should care about Search Engine Traffic report: Search engines can be a source of tremendous amounts of traffic, but you don’t want this percentage to be too high. Google can (and sometimes does) change its algorithms — and you could lose more than half of your visitors overnight. The following list describes traffic that comes to your blog by clicking the links in your RSS feed. There is no specific RSS Feed report in Google Analytics, because feed traffic is categorized under Other. You can still find this specific information from the Traffic Sources report by clicking the All Traffic Sources link in the left menu, then type Feed into the Filter Source/Medium Containing text field. Traffic Source: Your Feed report: If you have a high proportion of traffic coming to your blog by clicking through your blog feed, this means you have highly engaged readers who trust you and listen to what you say. Why brands care about your RSS Feed Traffic report: Again, an engaged audience will likely listen to what a blogger has to say. Why you should care about your RSS Feed Traffic report: Your feed is kind of like a mailing list, and is a true asset to your business to reach your readers off of your website on a regular basis. The following list describes your Referring Sites traffic. You can find this specific report from the Traffic Sources report by clicking the Referring Sites link. Traffic Source: Referring Sites report: This means that other bloggers and websites respect you and your content enough to talk about and link to you. Why brands care about your referral traffic: Your blogging influence likely spills over beyond your blog onto others’ blogs. And that means a brand that places ads with you might reach not only your readers but other bloggers’ readers, too. Why you should care about your referral traffic: Visitors from other blogs and websites similar to yours are the ones most likely to subscribe to your feed, comment on your posts, or become repeat visitors in the future. Plus: Link building is important to get your blog better ranked in the search engines.